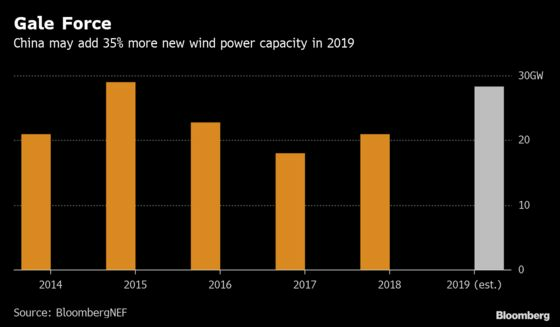 (Bloomberg) -- China’s wind farm operators are racing to install as much capacity as they can before subsidies disappear. The price is a blow-out in costs, which is eating into earnings and weighing on valuations. China Longyuan Power Group Corp., the country’s biggest producer, and Huaneng Renewables Corp. were expected to post buoyant 2018 results that would help them brace for a tougher year of increased competition and proposed price cuts. But those forecasts were upended by a surge in costs that drew opprobrium and caused their shares to dive. A heavy majority of analysts have retained their buy ratings on the stocks, even as many cut their price targets. In effect, optimism over the benefits of scale once the new installations are in place is being shaded by fears that rising operating expenses and financing costs will flow through into this year’s earnings and beyond. More than half of the 25 analysts covering Longyuan cut their targets on its Hong Kong shares last week, following results that CMB International analyst Robin Xiao called a “great disappointment.” Its stock is now trading 23 percent below a revised consensus of HK$6.98. About half of the analysts on Huaneng cut their targets and its stock is 30 percent below the new consensus of HK$3.01, after reporting costs that came as a “shock to the market,” according to Xiao. The two operators “are indicative of the Chinese market’s race to build reserved wind farms in the next two years, even though expenditure will grow quickly, as the nation may remove subsidies after 2020,” said Zhou Yiyi, a Shanghai-based analyst at BloombergNEF. BNEF estimates new capacity for 2019 will be the highest in four years. Operating expenses at Longyuan and Huaneng rose 6.5 percent and 14 percent respectively in 2018 from the previous year. The firms cited higher repair, maintenance and personnel costs from the addition of new projects and capacity. Both stocks fell more than 6 percent the day after their earnings and have continued to decline. Huaneng said in an emailed response to questions that it expects operating expenses in 2019 to be lower than last year, and that technology upgrades will raise power generation and revenue, offsetting cost increases. Longyuan didn’t respond to a request for comment. China’s drive for clean energy is an obvious backstop for the companies, and building capacity now will secure higher fixed prices in the event that subsidies are taken away. It means that pressure on the companies could be fleeting. For Huaneng, the accelerating capacity expansion will drive “faster earnings growth starting in 2020” that hasn’t yet been priced in, according to a note from CCB International, which maintained its rating and target on the company. Those looking for clear winners from the increased spending would have been rewarded by investing in equipment sellers such as Xinjiang Goldwind Science & Technology Co., which attracted upgrades and saw its stock gain more than 9 percent in Hong Kong last week. China Datang Corp. Renewable Power Co., another of the nation’s large, state-owned wind developers, reports earnings on Wednesday.